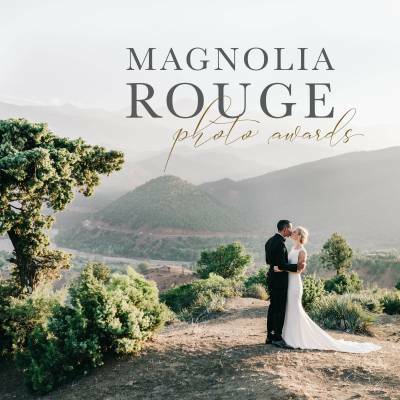 There is so much talent in the North-west corner of the United States, including some amazing Magnolia Rouge Vendors who feature in this shoot from the BELLE LUMIERE WORKSHOP. Lead photographer Seattle wedding photographer SARAH CARPENTER worked alongside Seattle wedding florist GATHER DESIGN COMPANY for this beautiful vision that takes place at BELLA LUNA FARMS. "In conceptualising the design for this bridal shoot, it was very important to respect and highlight the beauty of BELLA LUNA FARMS in its summer glory. The farm is a functional farm with gardens, chickens, and milk goats, but it exudes an effortless elegance. It feels upscale but relaxed at the same time. With this as our setting, we used only seasonal flowers in a warm neutral colour palette throughout the design. 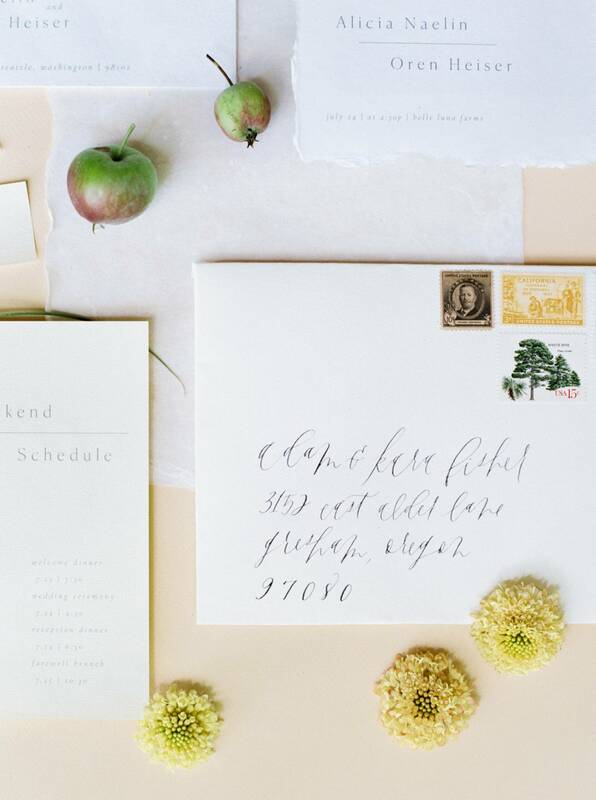 The invitation suite and day of paper good were crafted by JENNY SANDERS and featured hand drawn florals, modern typeface, and her signature calligraphy. We styled the suite with grasses and baby apples that were growing mere steps away. These elements were also incorporated into the floral design. GATHER DESIGN COMPANY used only local, seasonal flowers and foliage in a range of pastel blushes and yellows, and included soft textures to give the bouquet and centerpieces a relaxed feel. The bride, with hair and makeup by YESSIE LIBBY, wore two bridal looks: a classic off-the-shoulder gown by THEIA BRIDAL with a floral-embroidered overskirt by A LA ROBE, both from THE DRESS THEORY. 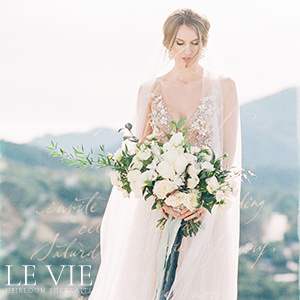 For the reception, she changed into a stunning LIZ MARTINEZ gown from LA VALLÉE BRIDAL. 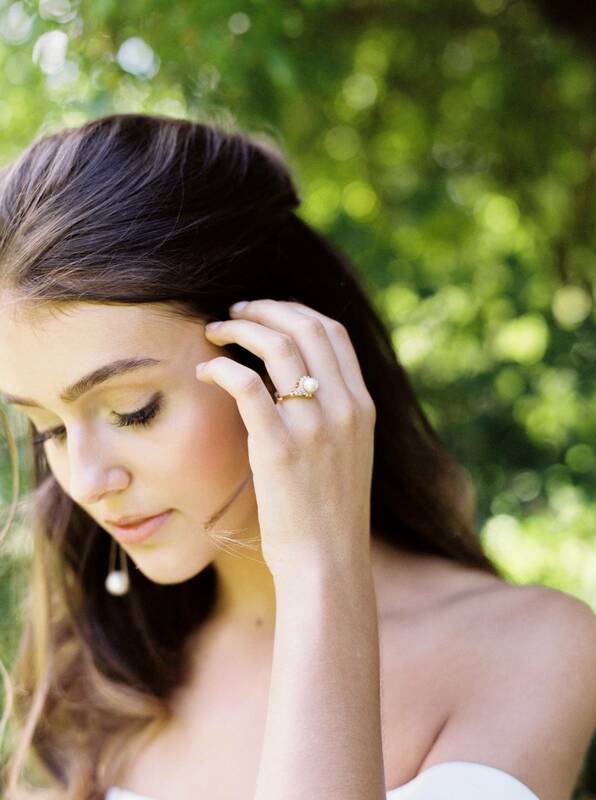 The pearl and gold ASHLEY ZHANG JEWELRY ring with drop pearl earrings and modern mustard yellow slides completed the bridal look. The square reception tables were set with three centerpieces, pillar candles, and modern plates, stemware, and cutlery. HONEY CRUMB CAKE STUDIO crafted a soft yellow three tier cake complete with baby apples and a statement peony, all made of edible sugar. STELLA WOLFE and THE MRS BOX provided beautiful ribbon and ring boxes for flat lay styling. SARAH CARPENTER'S film photography brought a fine art feel to the images, giving them a timeless, refined quality." 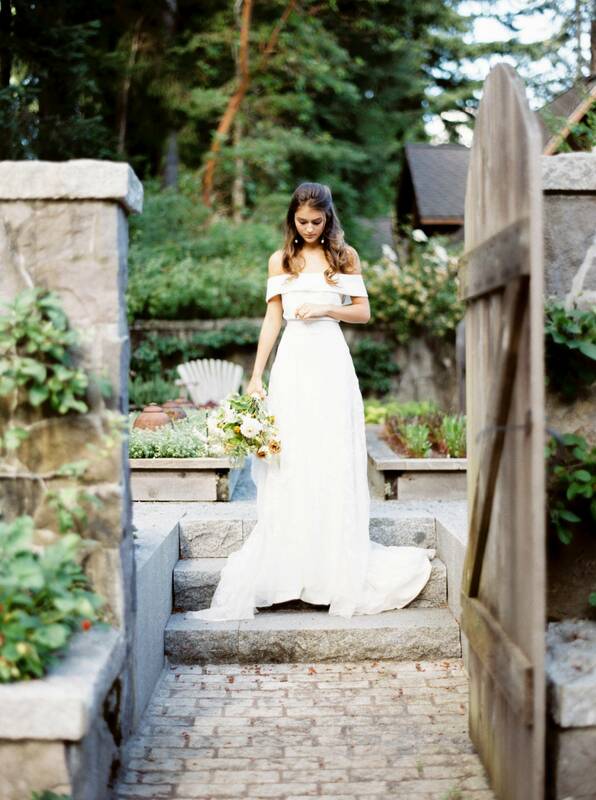 A big thank you to Seattle wedding photographer SARAH CARPENTER for sharing this stunning wedding inspiration with us. Sarah Carpenter is a talented Seattle based photographer with a love of the luminous, vibrant look and tangibility of medium format film and is inspired by the delicate but strong movements of ballet and golden sunsets. 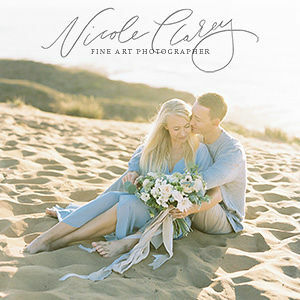 You can find out more about this talented Seattle wedding photographer here and you might want to check out this Simple Romantic waterside wedding in Washington. Seattle wedding florist GATHER DESIGN COMPANY is a valued member of the Magnolia Rouge Vendor Guide. 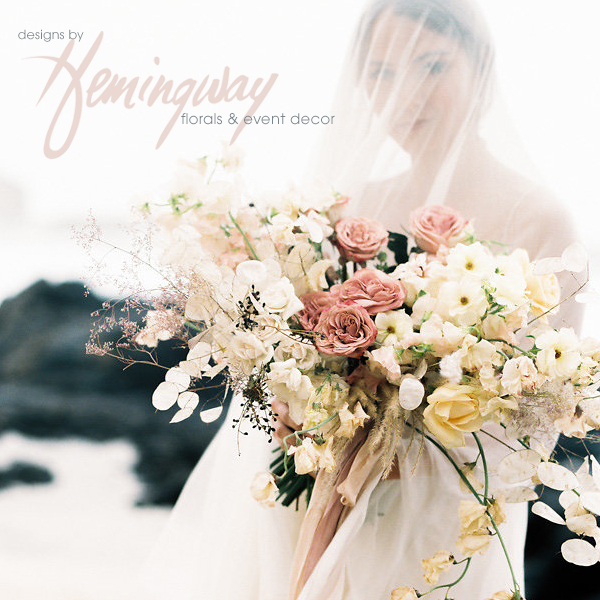 They approach wedding flowers as an artful medium to tell your love story. 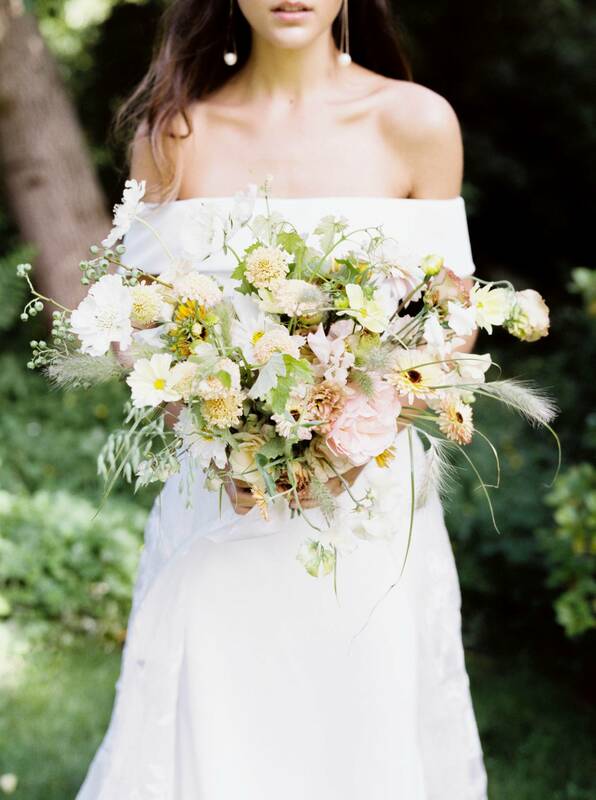 Your flowers will be beautiful, seasonal, and fresh, but more importantly, they will mirror the graceful way your gown flows, or the organic movement of the long grass surrounding your ceremony site. 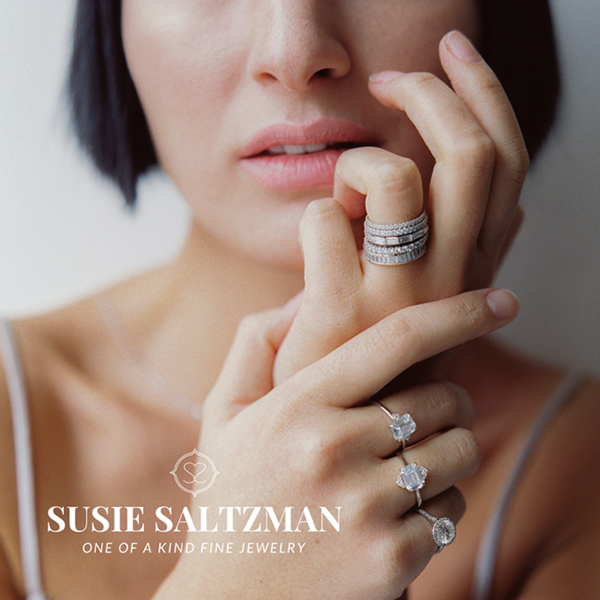 Their designs are at once ethereal and timeless, organic and architectural, and are always created with the intention of telling your story. Check out this beautiful Intimate Island wedding inspiration from the Pacific Northwest that they also designed and flowered.